David has always had a passionate interest in filmmaking and even as a child enjoyed making films for the entertainment of his friends. 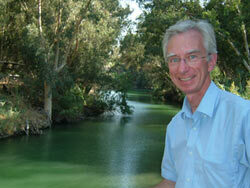 Early in his career David visited Israel and was completely captivated by the land and its peoples. ‘To be where such momentous Biblical events occurred was truly awesome! – I longed to be able to share the experience and the insights gained with as many people as possible.' His early films enjoyed great popularity at All Souls, but now his productions are seen all around the world, through TV transmissions, the internet, and on DVD. David's great passion is bringing the Bible alive to all ages and classes of people. 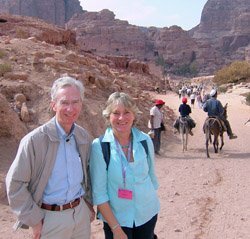 His extensive experience as a teacher has been of tremendous significance in the production of his film series featuring the Biblical sites in several lands. His films have proved immensely popular with a vast range of audiences. 'We've had totally secular audiences spellbound and children engrossed.' Everyone is enthralled as he explores the Bible's great dramas on the actual sites where they occurred. His fifth film in the series, 'Journeying with Jesus', is an extensive exploration of events in the life of Jesus – at the sites he knew so well. Working in close collaboration with leading archaeologists, David is a mine of information on fascinating new discoveries which throw fresh light on the significance of Bible events. 'The Holy City...and a Garden' is a kaleidoscopic view of Jerusalem and an exploration of the enigma of its Garden Tomb. Is it really the tomb in which the body of Jesus was laid? 'In the Steps of Moses' is an exhilarating exploration of the great Exodus drama from Goshen to Mount Nebo! Compelling viewing indeed! About a year's work goes into every film – and David loves every part of it! Research - biblical, historical, geographical and archaeological (often working with leading archaeologists,) – then the scripting, filming and postproduction. 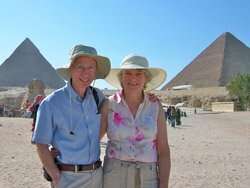 The films have stimulated such interest that David and his wife Giselle are now in great demand as leaders of their own tours to Bible Lands. 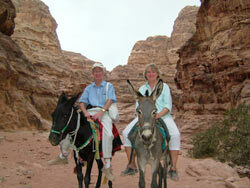 See our pilgrimages for details.